That’s right! 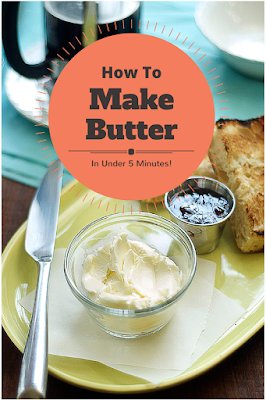 You can make butter in under 5 minutes. When I first researched making butter, I truly thought the butter would be A) hard to make and B) taste terrible. Both of these hypotheses were incorrect. This recipe is truly easy and the quality of butter is really unlike any I’ve tasted. All you really need is a stand mixer. A hand mixer will do but won’t be nearly as easy, although many of the posts I read called for shaking cream in a jar to make butter…Yeah. A huh. I kid you not. 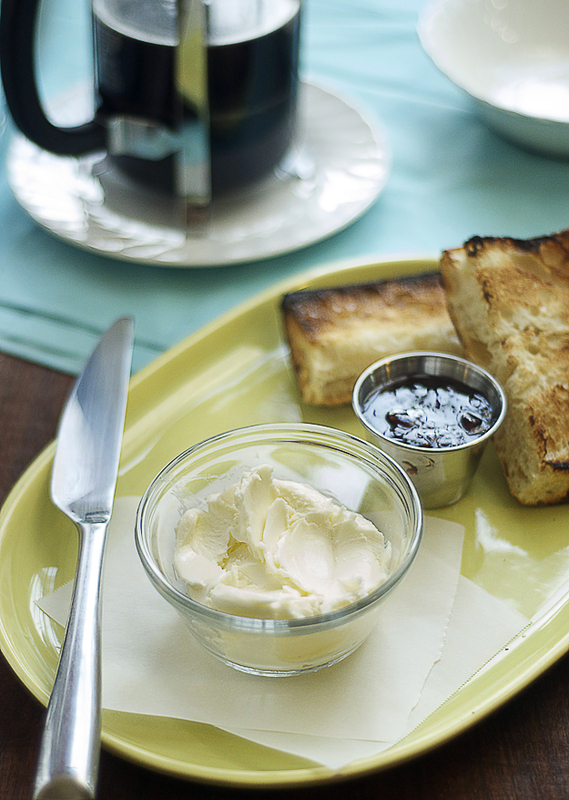 Also, check out this easy recipe for homemade honey butter! Homemade butter in under 5 minutes! Pour cream and salt into bowl of stand mixer and mix on high. In essence, you’ll be making whipped cream….only you’re going to whip the cream beyond this point. About 3 minutes. Soon it will deflate and start to look like scrambled eggs. Keep beating a few more seconds. You’ll notice water start to separate from the butter. This is actually buttermilk and can be saved for future use. Once buttermilk forms, remove bowl from stand mixer and fill bowl with cold, running water. With your hands, squeeze the butter together to form a ball. Keep massaging the ball of butter under cold water until the water runs clear. This will assure that all the buttermilk is removed and that your butter will stay fresh longer. Once water runs clear, remove ball-o-butter from bowl and wrap in parchment paper and chill in refrigerator, or slather on some toasted bread like I did! I find the shaking the cream in a jar method fun, thankyouverymuch! Can you make butter with goat's milk? Re above question: Butter from Goats's milk. You sure can – and very nice it is too. it tasts somehow less rich and slithery than 'normal' butter. It's sharper – fresher. The challange would be to find the goat's cream to make it with though! In my experience, goat's butter is more common in the shops (ie. one or two shops actually sell it!) than goat's cream, which i only remember seeing once in my life! Funny, I just posted about making butter too! The issue with goat's milk (as I've heard it) is that its fat molecules are 1/5 the size of fat molecules in cows milk. This means it doesn't seperate naturally into goat's milk and goat's cream. I think that you can use a centrifuge to seperate out the "cream" and go from there. Yeah, shaking in a jar works fine! We did it in grade school. You can even just use the carton the cream comes in. Easy! Thanks for all the great comments everyone! I love all the info on goats milk. I'm still not that excited about shaking a jar for an hour, but I'm a lazy slob, so that might have something to do with it. Thanks so much for sharing this wonderful recipe. Could you please let us know long the homemade butter can be stored in the refrigerator without tasting less good/going bad? Incidentally I just found out that valbresso feta, my current favorite cheese, keeps longer if you put it in salt water and change the salt water once a week. The butter will keep a good two weeks, but you have to remove all of the buttermilk during the washing period, otherwise it will spoil faster. A trick I found out after posting this is to use a pastry cutter to wash the butter. Obviously the buttermilk you keep is the that what is drained from the bowl when stop beating it. I can't imagine keeping all the liquid you're rinsing the ball o'butter with. Yes, anonymous. You only keep the buttermilk that separates when beating. Once you start to wash the butter you drain and rinse until the water runs clear. Maybe you could put a jar of cream in a paint shaker to automate the process. Would need to be a strong container tho. omg. something that I'ze gotz ta do! I just made the butter today, although I used way too much salt (1 tbsp for 1 guart) and although it's salty, it tastes amazing! Thanks for this idea! I'll do it right, next time! The "buttermilk" that forms when making butter is not the buttermilk that is called for in recipies like biscuts and fried chicken. That buttermilk is regular milk that has been inoculated with lactic acid producint bacteria. They are in no way interchangeable. The "buttermilk" that is produced when making butter is pretty much useless culinarily. "Originally, buttermilk was the liquid left over from churning butter from cream"
Having grown up on a farm, this is about the most amusing thing I've read today. OMG! You've figured out how to make butter! How.. Amazing! The leftovers aren't what you know as buttermilk, btw. Most of you know cultured buttermilk. Traditional buttermilk is closer in texture/flavor to whey. If you add some honey, you will have some good honey butter!!! What is the cream to butter ratio? I'd like to do a cost-benefit comparison. We just buy the store brand unsalted butter, tastes exactly the same as the more expensive butter. Just say no to margarine! Just to verify, you use the whisk attachment on your stand mixer, right? The black dog…yes, the whisk attachment. Is it less expensive than just buying butter? I think it's slightly less expensive if you're buying the really cheap butter….if you buy really good expensive butter, then this would be way cheaper and just as good….it's more about the quality. 1) I live close to places I can buy fresh whole cream from Amish farmers. That makes the most amazing butter ever. 2) If you compare store-bought with home-made butter the store-bought has a distinctive slight sourness that home-made lacks. Do they culture it before they churn it? I want to do this with honey butter, anyone know the right amount of honey to add? please let me know. Anyone know if you can use a cheesecloth to stran and kneed out the buttermilk? I'm not too big on handling it with my hands, and I don't have a pastry blender. sparklyunicorn, I think it depends on how sweet you want it. I would start with 2 tablespoons of honey and add more from there if need be. Anonymous, I've never tried a cheesecloth but I imagine it would work…you could also try using the paddle attachment on a stand mixer and adding ice cold water…mix and dump the water…repeat until the water runs clear. I just read your 20K hit article on this post. I am glad you shared it. That will help most of the bloggers in promoting their food blogs. And your recipe for making butter was really simple yet great. FYI–I think the glass jar method is much simpler and less cleanup—-probably faster, too! I took a 32 oz glass applesauce jar with a lid and poured in a pint of chilled heavy whipping cream and a clean rock from our beach (cleaned it with vinegar) . The rock was round and small, about the size of a robin's egg. Shake for about 3 minutes vigoursly–the kids helped with this. You'll hear the rock bouncing around! Suddenly, at about the 4 minute mark, you won't be able to shake it anymore. Lifting the lid reveals perfect heavy whipped cream. I put this into a wooden salad bowl (large) and then take a fork and mash it around–it will look like the scrambled eggs as described. Keep fluffing and pushing it around with a fork and suddenly you'll notice the buttermilk (traditional) coming off nicely. Squish the butter up against sides of bowl to remove more milk; pour off milk into a container*. 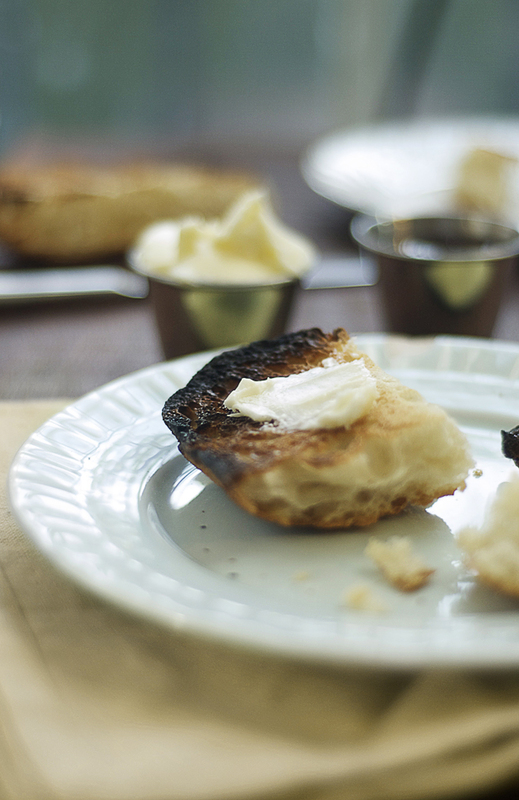 Continue to press butter against side and voila–you're done. Simple! I dont' rinse my butter as we use it too quickly. This pint yields about a 1/2 cup of stick of butter. After butter is formed, I sprinkle it with a little sea salt and then use two clean knives to form in into a "stick" of butter and refridgerate it. It will probably last only a few days on toast, baking ,etc. here! *Leftover buttermilk is technically NOT whey; contrary to what is posted above it is great to use in baking or even as a beverage and is called mattha and very popular in mideastern cuisine. A google search reveals many uses for this mattha. You mean all I need is a $300 dollar mixer to easily make butter at home? Why isn't everyone doing this? Wow, there are lots of sassy and sarcastic people out there. The term 'buttermilk' can refer to lots of different dairy drinks, but is decidedly different than cultured buttermilk (if you think anything you buy in a regular grocery store is the same as what can be made or grown at home you are fooling yourself). It is called 'buttermilk' because it was originally the milky liquid leftover from churning butter. 'Whey' is the liquid leftover from cheesemaking, they are different. And 'mattha' is the liquid, or beverages that use the liquid, leftover from making yoghurt (common in the mideast and India). And to previous Anonymous: many people who do a lot of baking or cooking already own a "$300 dollar mixer" (your use of the work 'dollar' is redundant, btw). I would always suggest using fresh cream from a local farm if you can get it. 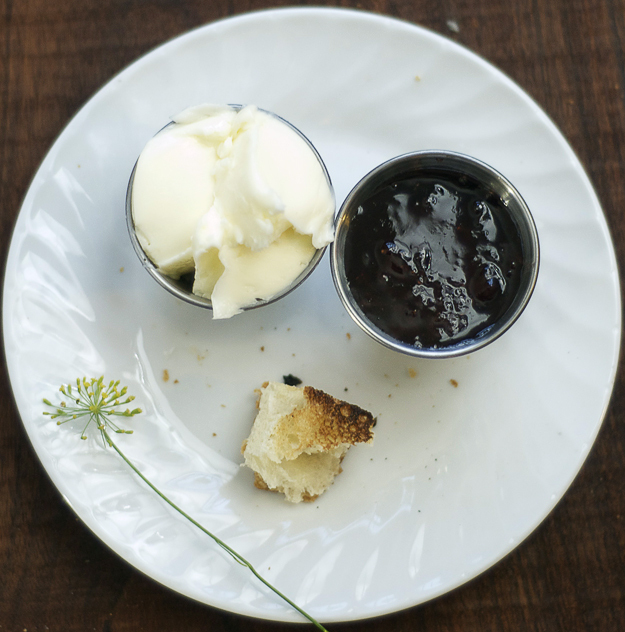 And besides using honey, homemade butter is great with the addition of blueberries or raspberries. Just remember, when you make foods at home you know what's in it! Thanks for the butter tidbits, and picture. I'm a visual learner and need the photos. I'm going to buy cream today! We've been experimenting with making a lot of our own foods lately. Our own "canned" chicken (using a pressure canner), jellies, jams, peach butter, applesauce. And the newest discover: homemade mayo! It trumps the store bought stuff like a jock on a nerd! Hi… I have just tried this butter recipe for the first time. It tastes fantastic!!! Tried it with some home baked bread..lovely. Thankyou so much, What a great site. I will be back! I'm so glad to hear that readers made this and liked it! This butter recipe looks fantastic. Can't wait to try it. Just discovered the art of canned butter online today, and am wondering if this recipe can also be used for canning butter? And if so, how? Thank you so much for this recipe and for the ever so helpful tips and pics. My family is thrilled with my home made butter! butter is simplistic- baby food jars work great when teaching children how to make it. One note…. it can make a bit of a mess if you don't have a splash guard for the top of your bowl or at the least drape a kitchen towel over the top of the mixer. I must have done something wrong. The cream whipped up and did not collapse. More whipping did nothing to improve the situation. So much for the easy way. Back to the tried and true way for me. How long did you whip it? You have to let it whip for a bit before it separates. I love butter! What a great post, no wonder it gets so many hits! How does it compare in taste and texture to butter that you buy in store? I have made this and the difference is like night and day from the store-bought brands. There is just something special about making things from scratch! It worked perfectly! Thanks for the straightforward directions and tips. My bread will be out of the oven soon, can't wait to try it! I just made some butter with my KitchenAid stand mixer. It took about 15 minutes. Perhaps it took longer because I started with raw Jersey cow milk that I scooped the cream off. I think I will be making butter on a regular basis now. By adding the salt at the beginning, I ended up with barely salted butter and salty buttermilk. Some sites say to add the salt after the butter has been made and knead it in. Also, some sites say to let the cream warm to about 60°, others say to chill it. I will have to experiment and see which is better. Thanks for the recipe. It tastes great! Does it make a difference if the Heavy Whipping Cream in "Ultra-pasturized". Once site said don't use the ultra pasturized. I purchased this kind to use with the preschool kids tomorrow. Can anyone answer this before 8:30am tomorrow? Also other sites mentioned leaving the cream at room temperature for 12 hours before breaking it down into butter. Anyone have experience with this method? I think it will work….you only need to leave it out if you want to increase the flavor. ayyyyy im doing this coniel thingy in class i need to make butter grr but in 3rd grade we made it but i for got T_T need to ask MOM!!!!!!!!!!!!!!!!!!!!! Excellent recipe / tutorial! Just made fresh butter for a holiday gathering in Boston. It came out great and added a personal touch to our event. Our guests couldn't stop talking about it (and asking for the link to this site so they could try!). Thanks for all the help and for the great instructions. I have been making butter by hand for quite a while now, and now at 7 months pregnant, my unborn doesn't like the "shaking of the jar" LOL My two older ones can't sit still long enough to help much. I have been looking for a butter churn and WOW they are expensive. My guess is that most people are simply collecting them now. What a shame that they aren't using them! Thanks for this article and the commentary…I now know I can spare my unborn the shaking and use my stand mixer. Hey boys and girls just wanted to say you DO NOT need a stand mixer for this (it's stated right in the post you snarky little monkies you). I have made butter just fine with a hand mixer many many times and my Grams could actually use a regular whisk (forearms like Popeye FTW) It does take a bit longer and I recommend using a LARGE mixing bowl set in the sink to make things easier. The key is to keep everything cold cold cold. Chill everything cream, bowl, mixer blades and all. The longer you can keep everything cold the faster the butter forms as it helps to keep the milk fats solid and easier to bind together. Take the butter ball that has formed and wrap it in several layers of cheesecloth and sqeeze it as tightly as you can by grabbing the tails of the cloth and spinning the ball to tighten. As for the remaining "buttermilk" try adding some artifical sweetener like Truvia or Splenda to it and pouring it over cereal instead of milk. It is basically skim milk at this point anyway. For a special treat take the butter you just made add it back to your stand mixer and add a pinch of kosher or sea salt finely minced garlic and parsley for a compound butter that will knock your socks off. thanks for the website. Just started buying milk from Amish farmer. It's about 12%cream on top! Cant wait to make my own butter. Stand mixer will not be used because I don't use electric appliances. Whisk or canning jar to shake works fine. Less cleanup. Never wears out. and you know what to do if the electricity goes out. I aleeady make my own bread and yogurt and everything else I can from scratch. It doesn't take much time when you get used to it. Everything is better and healthier. Oh we used to make butter by shaking a mason jar all the time as kids (in the 80's in a major city- not on a farm in the 50's). It's actually quite easy if you have two people to trade turn shaking. Of course a stand mixer must be much easier. But if you have kids around (or want to feel like a kid), it really is quite fast in a regular ole mason jar. Yes, shaking a jar is fun! You can also roll the jar across the floor or attach it to a rocking chair and rock (all day;D). If you want to make butter on a regular basis, this method is much easier. I have friends who make butter in their blenders. Butter from RAW ORGANIC COW OR GOAT MILK is amazingly healthy and will help you avoid all the junk in commercial butter. Also, pasteurized butter lacks the enzymes and vitamin content that make butter so good for you and easy to digest. It's worth the effort to find raw milk. Many cases of acne and eczema will disappear if you cut out commercial pasteurized milk. Now…why don't we learn THAT in school? How much butter does a pint of heavy whipping cream make? I would never do this, but it sounds relatively easy. Cheers to those who try it. Could you use a food processor to beat the cream into butter. We used a butter churn when I was a child and had our own milk cow. I just made this. And it's awesome. Easy! I can't even imagine the possibilities! With herbs, with spices, with….Oh my gosh! My mother used to put fresh cream (separated from fresh cow's milk) in a mason jar and put it in the back window of our Chevy. She would drive to town for groceries and by the time she got home we had butter. The sun through the window warmed the cream. If I could afford heavy cream, I could afford a box of butter 🙂 Cool though! Tried it, simple, easy, and delicious. Thank you! I use my food processor to make butter, fast and easy too! If more people realized that margarine was one molecule off of being plastic, they would take the 10 minutes of time to make their own butter. You can use a blender, too. Eliminates the spatter. If the cream is brought to room temperature, this takes less than a minute to turn to butter. It can then be easily poured through a cheese cloth to drain off the buttermilk. Frankly I'd rather go without butter than to go through all this. I'd just run to the store the next day . . .
Hello all. Great butter method using the standmixer, I used to use the mason jar with lid method until I stumbled onto this website. Sure it is not for the purist or those seeking exercise for everything they do, but a half pound of butter can be churned in about 15 minutes on high speed using Artisan by KitchenAid. This much butter came from a quart of regular dairy cream. Also I let the butter fly until minute 17 or 18 when all of the sudden to my amazement, the butter stuck to the whisk and I literally lifted the butter from the buttermilk. Made the rinse part easier. Just a practical hint. « Excellent Review of FOOD Inc.